Levy’s Elsa: An ice queen is born. Disney’s shareholders should be pleased, said Charles McNulty in the Los Angeles Times. 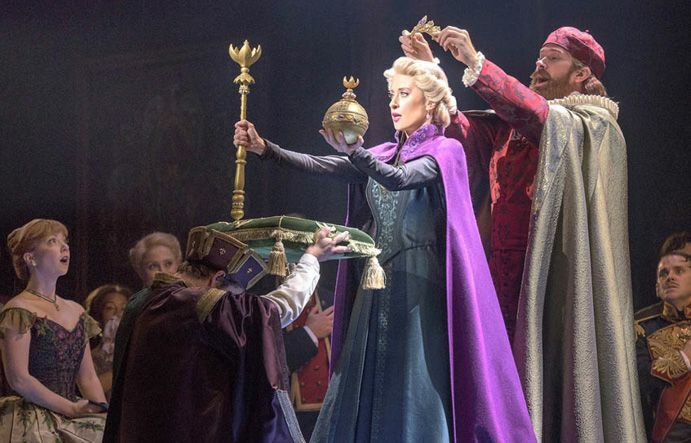 The new Broadway adaptation of the highest-grossing animated musical in history is competent enough that it’s “bound to add many more millions to the company’s coffers.” Granted, the talent was there to do something more. Nearly a dozen new songs were added by Oscar winners Kristen Anderson-Lopez and Robert Lopez, and two “captivating” actresses signed on to play the tale’s Scandinavian princesses, Elsa and Anna—loving sisters who are forcibly separated when Elsa discovers she has the ability to discharge icy blasts from her fingertips. “But thundersnow hasn’t struck twice.” Though “relentlessly perky,” the stage show is only “moderately entertaining”—it will satisfy old fans but find few new ones. That said, “there’s much to revel in,” said Sara Holdren in NYMag.com. “The stage is a lush Scandinavian paradise,” and “the ensemble is bright and buoyant, with the regal Caissie Levy belting her heart out as Elsa and the adorable Patti Murin charming the lederhosen off everyone as Anna.” But the show is 50 minutes longer than the movie, and the padding shows in an opening act that drags in the run-up to its climax, Levy’s “genuinely electric” rendition of the hit ballad “Let It Go.” The second act feels freer, opening with a number that adds “a heaping helping of sublime silliness,” including a kickline of bodysuited sauna bathers.